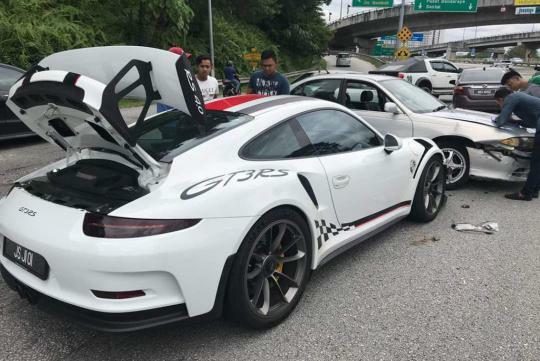 A Proton has been caught on someone's dashcam driving recklessly and crashing into a Porsche GT3 RS in Malaysia. The accident was said to have happened in Kuala Lumpur a couple of days ago along one of KL's major roads. As one can see from the video, the driver to the Proton Perdana was speeding and wanted to overtake the Porsche. However, the Proton driver overreacted to the movements of another car and lost control of his car as he hit the brakes. To make matters worse, the driver of the proton is believed to not have a driving license nor insurance coverage too. Don't even have a kopi lisense, what do you expect? Come to think of it give kopi lui can already, who needs a lisense? Ohh lord! This was so frightening. God knows when these people will understand that knowing how to drive isn't a skill to boast about and this was not even driving this was just next level of rash driving.